Acts 242 Study | Why Do We Bless Our Food? 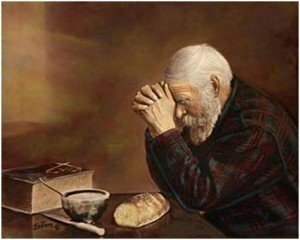 As Western thinking Christians today, it is a common practice for us when praying before a meal to say, “Lord bless this food to the nourishment of our bodies and our bodies to your service.” Where did this practice of blessing the food before the meal come from and can we find a biblical base for doing it? Some research into the history of this subject provided some interesting answers. First of all, in the Hebrew Scriptures that Jesus would have grown up on, there is not a single instance in which there is a command to bless the food before a meal. The only passage that would come close to indicating this would be Deuteronomy 8:10, “When you have eaten and are satisfied, bless (praise) the Lord your God for the good land He has given you.” In this verse however, it says to bless, “after the meal” and not before the meal. Also, this verse says to direct the blessing towards God and not the meal itself. Marvin Wilson says, “Unlike the practice of most Western Christians today, in Bible times, the Hebrew people did not see the need to bless food, drink, or other material things. In prayer, they focused only on blessing God, the Creator and Giver.” Why was this the case? Wilson continues, “The ancient Hebrews would have never thought of blessing what they ate. The idea would have been totally foreign to them; it would have been an insult of sorts, to God! If everything that God created was very good (Genesis 1:29-31, and Genesis 9:3-4), why should someone imply that it was unholy and profane and needed to be blessed again by God? The idea that you had to sanctify, cleanse, or purify what God had already said was good would have been foreign to the early Jewish people. To do this would have suggested that food and drink were unacceptable until they were blessed and made holy through prayer.” How then did our practice of blessing the food originate? In all likelihood, this practice has its origins in Greek thought. The Greeks and Gnostics shared the belief that material (physical) things were, by nature, unholy and unclean. Therefore, according to this belief, it was necessary to “make holy” the things that were of this world. You could point out that there are several examples in the new Testament of Jesus giving a blessing at meal time. For example, in Matthew 14:19 it says, “He gave thanks and broke the loaves.” Also, in Matthew 26:26 it says, “While they were eating, Jesus took bread, gave thanks and broke it.” Almost every Bible scholar agrees that the “thanks” or “blessing” that Jesus would have given at these meals would have been the b’rakhah (blessing, benediction) that Jews have said for over two thousand years before meals. Jesus would have said, “Barukh attah, Adonai Eloheynu, melekh-ha’olam, haMotzi lecheem, minha’aretz”, or in English, “Blessed are you O lord, our God, King of the Universe, who brings forth bread from the earth.” In this age-old prayer that Jesus would have recited, again God is the one being blessed and not the food. You say “let us bless God”.. I find this an odd expression, especially in light of your earlier reasoning that we shouldn’t bless food because that indicates that it is somehow unclean. Wouldn’t it be better to say “let us thank God”? For a long time I’ve found it strange that we must bless the food or else, what? The food will rot in our stomachs until we get sick? Instead, I chose to believe it is a common ritual that offers more purpose to summon a family to eat together. It is the beginning of the family meal ritual. I bless my food and I even go back and thank God after I eat. I find that it’s a way of appreciating a God that feed us rather we believe he’s the one doing it or not. It’s not a ritual or tradition it’s facts in the bible even God bless the food he made for him and his disciples when he blessed it. Great article. Used it as a basis for my own thoughts. Referenced, of course. Keep up the great content. Wow. I’ve been saying the “bless and make nourishing” spell my whole life. #blindreligion at its best. Whe I “bless” my food I simply thank God for the wonderful abundance He has given me. I don’t actually ask Him to “bless” the food because I’ve never seen this done in the Bible. Nothing is wrong when we ask God to “bless the food”. We should not make it complicated. I agree, to not over complicate it. God is a loving, understanding God. When we acknowledge Him through blessing our food, we are blessing God who provides so that we may eat. I believe it is pleasing to Him. Also, in today’s society where our food comes from so many sources that we may not be aware of whether it’s prepared at home or in a restaurant, my family and I are definitely asking God to sanctify and bless the food for the nourishment of our bodies. What about Matthew 26:26, doesn’t that indicate that the Messiah blessed the food before eating it? No – he gave thanks to God. Remember the question is ‘Why do we Bless our food’. The thinking here is we should Thank God and not Bless food that is already blessed and provided by God. And to add my 2 cents to the article: Human beings are creatures of habit and it’s a good thing of forming a habit of expressing our gratitude unto God for providing us food while so many are starving. I believe the purpose of asking God to bless the food is to acknowledge that our bodies are holy and to ask that the food we put into them is sanctified, just as we ask God to sanctify us. Yes, we always give God thanks. Meal time is no different. Remember all food comes from a seed. Give that some thought. Now look at your authority in Christ. I bless my food in the name of Jesus Christ that what is grown on this earth will give life, health and healing to my body, the temple of the living God. Then Jesus took opportunity to share with them that which should happen to him…that his body should be broken for us. The blessing of bread and wine mentioned here is that referred to by the Catholic church as the Eucharist (the miraculous transformation of bread and wine into that of jesus’ literal flesh and blood). Whether literal or symbolic is not the issue here, the issue is that this blessing of bread and wine is to be a “remembrance of me”‘… an homage to Jesus and a declaration of or faith in his accomplished work. This blessing is not a blessing of food to nourish our bodies. Our food nourishes or bodies whether we bless it or not. Unbelievers get nourished by food with no connection to God at all. This blessing of bread and wine is not a blessing of “simple, common food”. It is a much greater act or event. It is our declaration of faith and acceptance of his revelations as truth. In essence we declare god as our father. We declare that we can’t reason a better explanation of truth. We believe in God. Notice that Jesus himself blessed the bread and the cup. And when we pay to bless “the bread and the cup” we ask Jesus to bless it. It is therefore imperative that we understand that this blessing of food is to convert common food into “his flesh and blood” (literal or symbolic). When we eat beans and rice or hamburgers and French fries we are not partaking of the Lord’s supper. When Y’SHUA did the Bracha (blessing) it was to The Creator. If the Hebrew people believe that everything God made is good why do they have the purity laws in Leviticus? what laws are purity laws in Leviticus? Jesus was our model of life here on earth, he gave thanks for the food in more places than the one place in the old covenant deut 8:10. Besides we are to always before after and forever give thanks and praise to our Father. To bless is to confer or invoke divine favor upon. Therefore, we as man simply cannot bless God. Only God dishes out the blessings. We should be thankful for what God has given us, thus.. saying a prayer prior to consuming food. Growing up as a child we said this pray before all meals whenever, wherever we were eating and drinking and I still say it to this day: For what I am about to receive, may the Lord make me truly thankful, for Christ’s sake. Amen. Good thoughts. But notice that though the verse mentions that the disciples “did eat their meat with gladness and singleness of heart,” or even if it was rendered “thankfulness of heart,” it doesn’t say anything about blessing before or after. So they may or may not have prayed for their food before or after the meal. But all we have is what scripture says, and as a rule we should draw out the meaning based on what it does say, not read into the meaning and say it means something it doesn’t actually say. Pingback: Day 71 (Jud 4-5, Psalm 71) – Read the Bible in a year! Am glad for this controversial discussion. I will like to state 3 attitude a Christian or Christians should follow during meal to balance biblical concept. 1. Thank God for your meal. 2. Pray for your meal, speak to your meal to posses healing power and nourishment value cos sometime our food lacks nutrients but via prayers such food will carry virtue to repair warm out cells by faith in us. I think what people are missing about this topic is that the Bible doesn’t make a clear command that we should “bless our food.” It does say we should do all things in Jesus name, that we should be thankful in all things, that we should give thanks in all things through Jesus, things like these. So it’s not wrong to thank God for your food, or to ask Him to bless your food, or to do it before or after. It would do more help than harm if we went ahead and did both! But let’s not act like the Bible commands one of these specific practices regarding meals. It simply isn’t there in the scriptures. Jesus did bless and separately give thanks for the loaves and fishes before distributing it. That would not be blessing God, but the actual food. Other than that, Alma said we should pray over ALL things…crops, servants, family, jobs, etc. I’m sure food is included, though not specifically asking a blessing upon it…or to make the food holy. I believe giving thanks for food is something any Christian should do, but asking a blessing upon it (“God, make this food holy, nourishing, stengthening to us, etc…”) is repetitious prayer, redundant, and a ‘cultural’ thing that gives false doctrine creep in the church.